This is the 11th post in my series on Boston’s Bronze Menagerie. Two of Boston’s 100-odd colleges and universities sit side by side on Huntington Avenue, which is also known as the Avenue of the Arts. Back when one of my brothers attended Wentworth Institute of Technology and I went to Northeastern University, the two campuses were not contiguous. Both have grown over time, however, and now they bump up against one another. Despite the movie’s dour scenario, however, the leopard and the husky seem to get along pretty well. 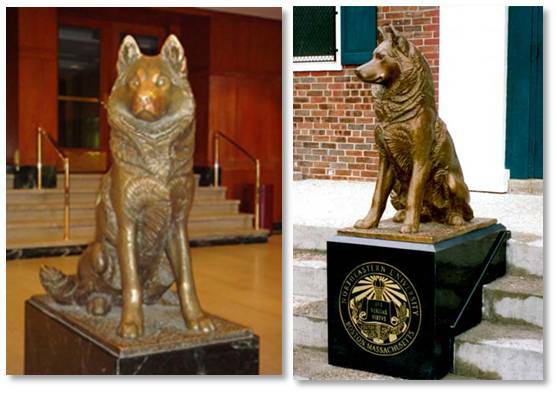 Northeastern’s mascot has been King Husky since 1927, the same year the school adopted red and black as its colors. A series of live dogs held the title but that approach was discontinued, reinstated, and discontinued again. In 1959 a fund was raised to create a permanent statue. NU commissioned Boston’s firm of Cassieri and DiBiccari to create the bronze mascot. The statue was sculpted by Anne Philbrick Hall and installed in 1962. King Husky is a large dog that sits on a plinth in Ell Hall just inside the front doors and he looks outward toward the Krentzman Quadrangle. University tradition says that students who pat his nose will have good luck and bring good fortune to the school. All the attention has made the dog’s nose suitably shiny and somewhat worn. An informal tradition started by NU’s male students, says that King Husky will bark when a virgin walks past but this is false. Just saying. Another casting of the statue sits outside the entrance to Northeastern’s Parsons Field, where the school’s baseball, soccer and lacrosse teams play. Unlike Northeastern, Wentworth never attempted a live mascot but their bronze leopard crouches on a red rock boulder alongside Huntington Avenue. The six-foot-high statue, sculpted by Robert Shure, was unveiled in May of 2003. Mr. Shure also worked at Cascieri and DiBiccari studio when it was extant. Another, much smaller cat also sculpted by Robert Shure occupies the NU campus. He is one half of the statue named “A Man with a Cat Named Yitz” that sits on a granite bench outside Shillman Hall between Forsyth and Lenox Streets. The statue appeared overnight in February of 2011 with no advance notice. 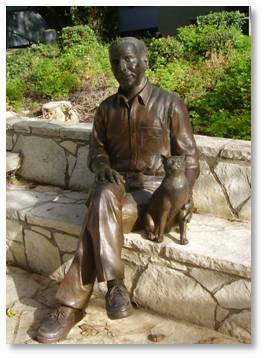 The bronze human is Robert J. Shillman (E’68), founder and CEO of Cognex and a benefactor for whom the classroom building is named. Yitz is a stray cat whom he befriended. Northeastern students refer to the little animal as Shillman Cat and he has a lot of friends. Even though he’s smaller than King Husky, not to mention a leopard, he’s clearly the big guy on campus. Shillman Cat frequently poses for photo ops and selfies and is sometimes enlisted to support causes. He has his own Twitter handle (@shillmancat) and you can search for him on Facebook or check in with him on Foursquare. Friends of Shillman Cat make sure he is well dressed in a custom-made wardrobe: a bow tie for Halloween, a Pilgrim hat for Thanksgiving, knitted hat and sweater for winter, mask and beads for Mardi Gras, etc. School tradition says it’s bad luck if Shillman Cat crosses your path. Unlike real-life felines, however, he tends to stay where he was put. You can park at meters on Huntington Avenue or on some of the side streets. If you can’t find a space on the street, park in the Prudential Center garage and walk west on Huntington Avenue. For public transportation, take the MBTA’s Green Line to the Northeastern stop and walk west or to the Longwood Medical Area stop and walk east. If you get off at Northeastern, cross Huntington Avenue and go through the Krentzman Quadrangle to Ell Hall. Go in the main doors and King Husky will greet you immediately. Then go back out to Huntington Avenue and turn left. At Forsyth Street, turn left again. Walk past Greenleaf Street and the College of Professional Studies. Turn right and Shillman Hall will be on the left. “A Man with a Cat Named Yitz” are waiting for you outside. Finally, go back down Forsyth Street to Huntington Avenue and turn left. Walk past the Museum of Fine Arts and the Wentworth playing fields. Cross Louis Prang Street and look for the leopard on your left.